Bruce Lee was a main influence in my life. Not that I have any talent for martial arts or any interest in fighting, but Bruce Lee was and still is one of my heroes. I have warm memories of going to see his movies in the seventies. Kung Fu movies played in cinemas where I wouldn’t want my children to go to now, but of course my parents had no idea that I was there. Most people who went to see these movies knew them by heart and it was a sport to recite the texts and the sound effects as loud as possible. Also there were always people in the audience who couldn’t resist demonstrating their own fighting skills. More than once we had to leave the cinema before the end of the movie, because was more fighting going on among the audience than on the screen. Kung Fu and other martial arts are a popular theme in pop music, although I am aware that my collection is not really representative for pop music in general. But there is more than enough material for a great compilation CD. I expect there would be an audience for such a CD, so I wonder why it is not yet available. 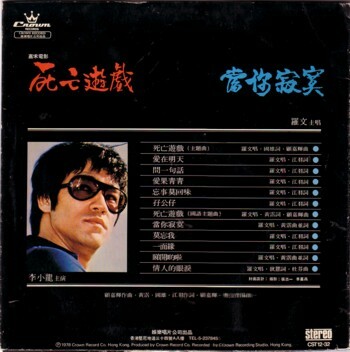 Among the Kung Fu rarities in my collection is a Chinese LP, released in 1978 on Crown Records, Hong Kong. That’s all information I have on this LP, because the rest is in Chinese. 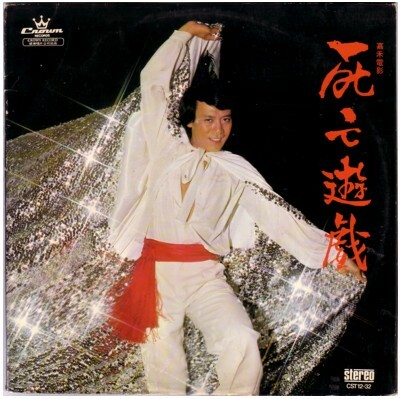 It is a disco LP and there are only two songs that have Kung Fu sound effects. Here is one of them.